Singapore does not have any natural oil resources but local companies are actively involved in exploration in various parts of Asia Pacific. Singapore Petroleum Company Limited (SPC) has exploration operations in China, Hongkong, Thailand, Vietnam, Cambodia, Malaysia, Indonesia and Australia. Singapore’s consumption of oil was 1,002 thousand barrels in 2010, an increase of 3.5% over 2009 figure. Its gas consumption was 9.7 billion cubic metres, amounting to 5.6% increase compared to 2009. The city-state is a major hub in Asia for oil trading, both for physical delivery and in financial instruments. As a bulk liquids hub, it ranks amongst the top three in the world. The Singapore oil sector is not a standalone industry. Refining has been a catalyst for the chemical industry, as well as creating other sub-sectors such as oil and gas equipment and oil rig manufacturing. Then city-state has become an important refining and distribution centre for refined oil products. 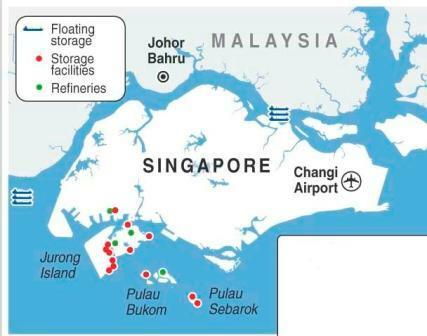 Most of the Republic’s offshore petroleum services are concentrated at Loyang Supply Base, which for nearly four decade, has raised its status as Southeast Asia’s key offshore logistic hub. There are more than 200 well-established oil and gas service companies in Singapore. Among them are world terminalling and storage companies like Vopak and Oiltanking, which set up operations in the country in the 80’s. Oiltanking Singapore Limited has a total storage capacity of 1,165,680 cbm at Seraya Avenue and JI Highway. Horizon Singapore Terminals operates a 1,237,400 cbm facility on Jurong Island. In 2007, JTC Corporation, the national infrastructure developer commenced construction of Jurong Rock Caverns which is a network of tunnels for storage of liquid crude oil, condensate and products like naphtha. At a cost of $950 million, the first phase will offer storage for 1.47 million cubic metres, or about 9 million barrels of liquid crude oil, condensate and products like naphtha. A second phase with 6 additional caverns, will expand storage capacity by an additional 1.32 million cubic metres. In additional to rock caverns, JTC has also recently concluded a technical feasibility study to build a floating structure for oil, based on similar storage platforms in Japan. The floating storage barge, with a capacity of 300,000 cubic metres, will be anchored near one of the smaller islands off Singapore. Singapore is also host to 2 of the world’s biggest oil rig builders, Keppel and Sembcorp Marine, which provide essential marine and offshore engineering activities in the assembly and maintenance of FPSO conversions, fast ferries, ship repairs, offshore support vessels and jack-up rigs. In moving the energy industry up to the next level, Singapore seeks to increase its refining capacity from the current 1.3 million barrels per day. The expansion of existing refineries and optimization of refinery operations will not only help to maintain Singapore’s share of global refining capacity but more importantly, put the country in good stead to enhance the growth of its oil trading activities by creating the critical volume of export-oriented refining throughput. Singapore is a strong base in the region for R&D. Within the energy sector, it is fast gaining leadership as an R&D base for alternative fuels and the next generation of biofuels. It is also channeling its R&D capabilities towards developing high-value products such as lubricants. In its effort to extract more value from refineries, Singapore has achieved headway in key R&D areas such as process optimization and catalyst development which maximize the use of existing refinery assets. Natural gas consumption has increased in recent years, mainly due to government programmes encouraging the use of natural gas in order to reduce carbon dioxide and sulfur emissions. In the pipeline business, Singapore Petroleum Company holds interests in three regional gas transmission pipelines. The 654-kilometre West Natuna Transportation System is the first Singapore cross-border sub-sea gas pipeline carrying gas from the West Natuna Sea to Singapore. A consortium of PSC blocks in West Natuna including the Kakap PSC owns this pipeline. The second direct gas pipeline is the 468-kilometre Grissik-Batam-Singapore pipeline linking Indonesia to Singapore. 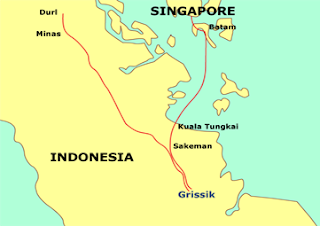 Gas to Singapore commenced in 2003 under a 20-year term contract between Singapore and Indonesia. The third gas pipeline is the 536-kilometre Grissik-Duri pipeline that transmits gas from Grissik gas fields to Caltex’s Duri facilities under long-term contracts that commenced in 1998.